So what's wrong with normal P-90's? Not much - in fact, it has the potential to be the ultimate pickup. But two problem aspects are the strong tendency of the neck position wound strings when played as a chord to turn to mush under aggressive pick attack; that and the large amount of mains hum. A lot of P-90s also have offensive midrange spikes and sound ragged (abrasive). 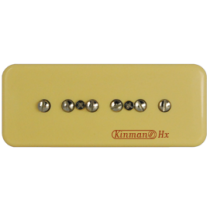 During the course of the development period Chris Kinman came to realize that some manufacturers of P-90 are under-winding for a lower output in an effort to reduce 60Hz hum. Unfortunately they also lost a lot of revered sonic characteristics. Improvements: Definition and clarity are improved in order to reduce the neck pickup's tendency of turning to 'mush' under heavy pick attack. This was accomplished by increasing the dynamic range and the sound remains un-mistakably P-90, with the same brutal output as the original and the characteristic P-90 muscular sound that in many ways is more likeable (and more silent) than a humbucker. The P-90 Hx is an incredible and highly versatile tone machine. 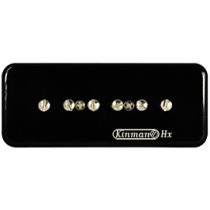 Just how good is the Kinman P-90 Hx? Whether you like the sound of a P-90 in the neck position or not, the true test of quality of a P-90 is whether it sounds GREAT in the neck position or not. 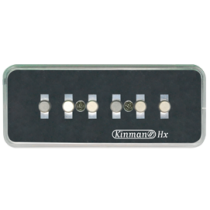 The Kinman speaks with a BIG voice, notes are so alive they just leap out and it sounds gorgeous and luscious in the neck position. With it's baseball bat attack it won't turn to mush too easily when played hard. The sound has piano-like mids, huge deep and warm lows, sweet transparent highs that sizzle rather than clang and dynamic range that takes you from a tonefull gentle whisper to a crunched power chord in a nano second. One more important test is 'does it sound great at low volume?' If a P-90 passes both these tests in the neck position it will sound superb in the bridge position too. Then and only then can it qualify as an authentic sounding P-90 and you'll know because you wont be able to put the guitar down.